Pecatonica Prairie Path is not on the Grand Illinois Trail Ride. Yet. The Pecatonica Prarie Path is an approximately 23 mile trail located between Freeport and Rockford. The plan requires a connection to the Jane Addams Trail. The completion date is not clear. One continuous paved Trail from Rockford the The Jane Addams trail west of Freeport would be a welcome gift to the communities bordering and the tourists doing the Grand Illinois Trail Ride. The Jane Addams connects to bordering state Wisconsin, and allows for many travel options. 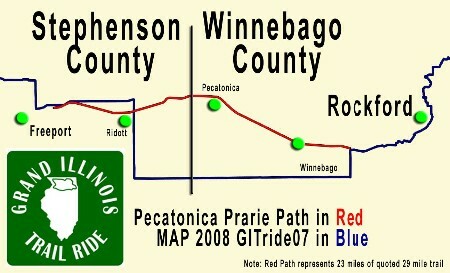 News reports by Kevin Haas at the Journal Standard may identify that parts of the Pecatonica path are certainly ready for inclusion to map 2008 GITride07. We encourage our users to create alternate maps to include new features on our 2008 version of GITride07. Updated cue sheets and descriptions will need to be completed also. Recognition awards may be available. Please consider free registration for your opportunity to contribute to the project.